I guess I better get to the 2015 round of resolutions I cannot possibly keep while we’re still in the afterglow of a new year’s dawning. Finish the following Single Page Sensations- I am over halfway done on almost all of the following, so I’d like to finish as many as possible. 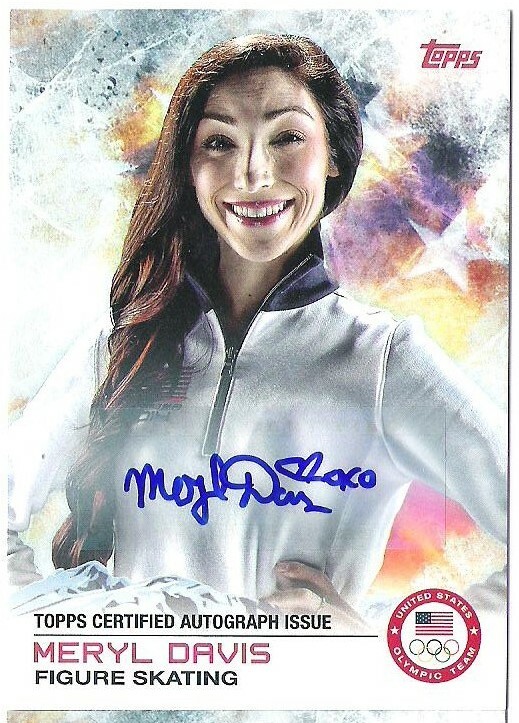 Add 2 new licensed and 5 new personal Raven sketch cards- The former are crazy expensive for a B-list team character and there just aren’t a whole lot of either to go around. I think these are pretty reasonable numbers to strive for though. Finish both the licensed and PSC DC Comics miscellaneous Single Page Sensations- I am starting the year at 4/9 licensed and 3/9 PSC. 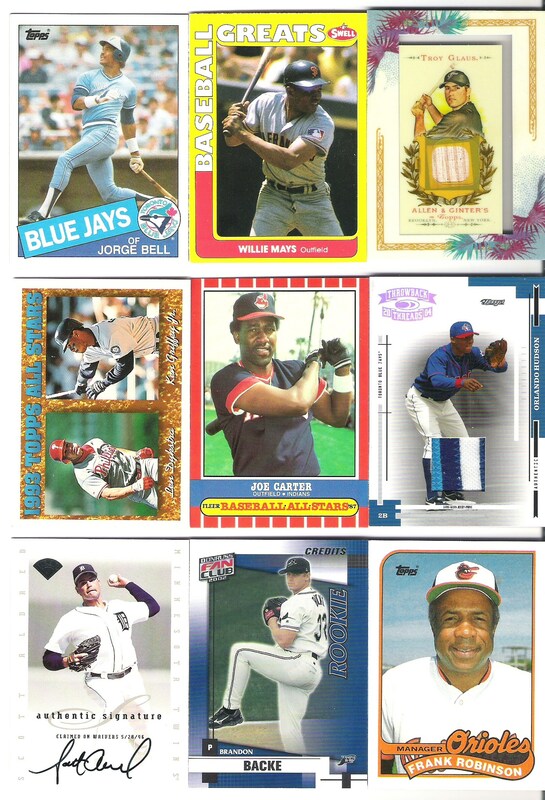 Complete any other sketch card Single Page Sensation- Lots to choose from, but I’m over halfway done on but a very few. 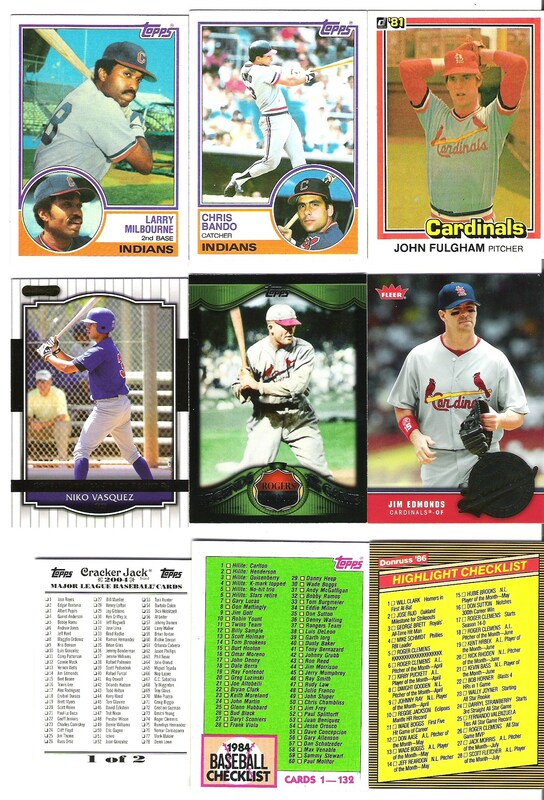 Write 80 new posts- Again, we’ll up the ante a juuuust a smidge from 2014. I did a good job of posting with a fair degree of regularity when I was actually here and posting in the year gone by, so I think I can average a little better than 1.5 posts per week in the year to come. 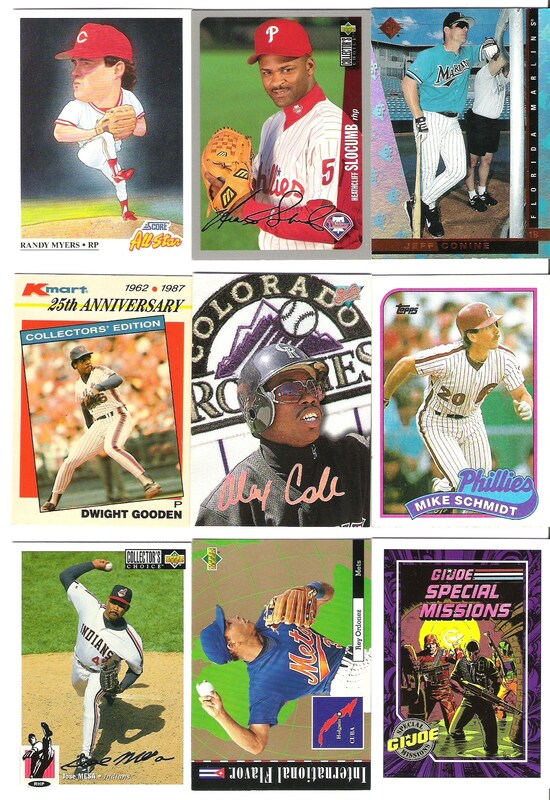 I’m not going to make any requirements on the number of non #collect-focused things this time though. I feel that was a small contributor in falling off the map so early last year. I’m stupid (not true, but I am very, very lazy), so I’m going to keep it simple. Complete 50 new sketch cards- I managed 38/50 last year (1 side of that weird Marvel two card puzzle was completed). That was close enough to not feel too much shame, especially in light of how much I managed to draw in total. Still, this isn’t close enough to up the ante, so I will give the same number a good go again in 2015. Paul Molitor (repurposed) and Boromir of Gondor (artist tile) are the first two in the queue. 100 total new works- I’m pretty sure I coasted past this number last year, and if you consider the multiple pictures on single pages as individual works, then I did even better. Everything was unofficial, however. Finish 30 old sketch cards- I barely finished any old cards in 2014, and I don’t feel like I did a very good job on what I did do, so I’m making this a point of emphasis in the new year. I’m off to a good start, having already finished seven oldies on January 2nd (also colored most of two others). I’m also happy to report my coloring seems to be back to nearly as strong as it was at the height of my powers a couple years ago. You can keep track of my 2015 art progress HERE. Finish a first draft of any novel idea- I barely got anywhere on anything last year, and while I’d like to say a more stable computer situation would have helped, I’m not so sure… There can be no excuses this year though. I just bought the one I’m currently writing from a month ago, and I hope to have a laptop, and the additional mobility that entails, to go with it by spring. Aaaand that’s all for this post I guess. There are plenty of other things I’d like to accomplish in 2015, but these are the most pressing and/or well-defined. A bit simpler than last year, and I’m sure I’ve probably broken a couple resolutions already, but thanks for stopping by! Hi! Wow, we’re gonna be posting two days in a row! If I may be so bold as to promote an internet buddy of mine’s podcast for my nerdier readers out there before we get to it, I’m listening to the latest Nerd Nation Podcast (with guest Savage Hawkman’s Mark Poulton) as I type this. Lots of technical difficulties this week, but the interview is aces. Check the archives too, they tend to get some pretty outstanding guests. With the unsolicited promotion out of the way, let’s get right into this here recent COMC order then. We’ll start with the basketball & football keepers I guess, since that’s what I typed in the title section. 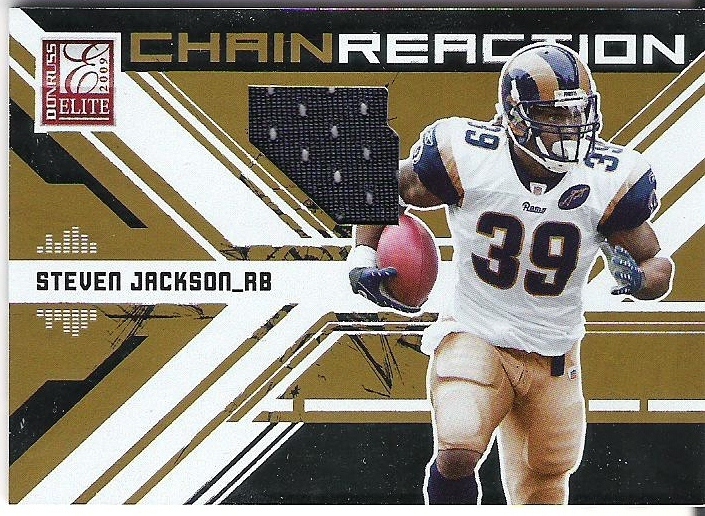 First up, new Steven Jackson! 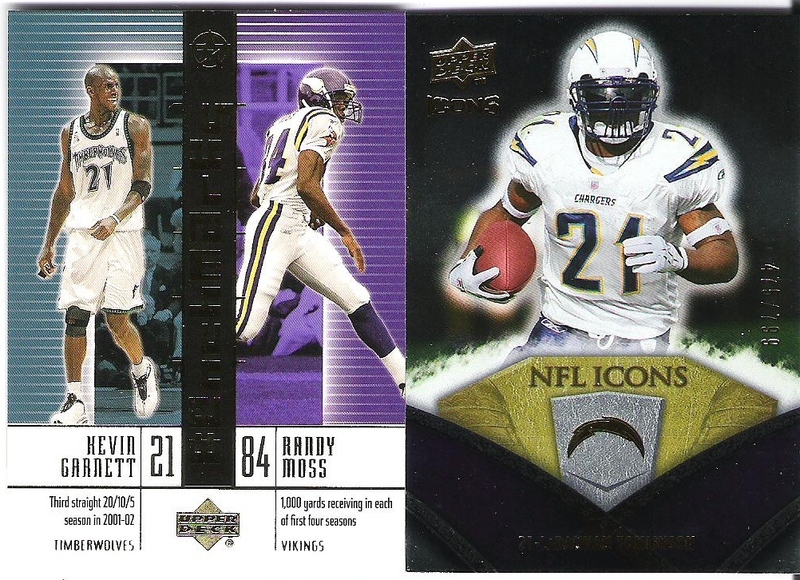 Early 2000s Upper Deck multisport Moss/KG and an LT /799..
It’s true. He’s Julius Caesar! I can’t find the review, but he’s apparently pretty good. 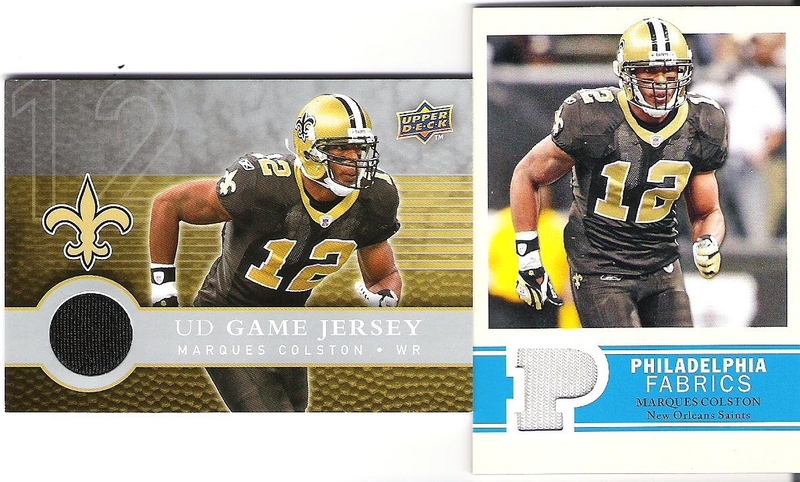 Sweet Spot Warrick Dunn, Prestige & BowSter Jamaal Charles..
Upper Deck & Philadelphia Marques Colston jerseys..
Flashback Fabrics and Blue Inception /209 MJDs. 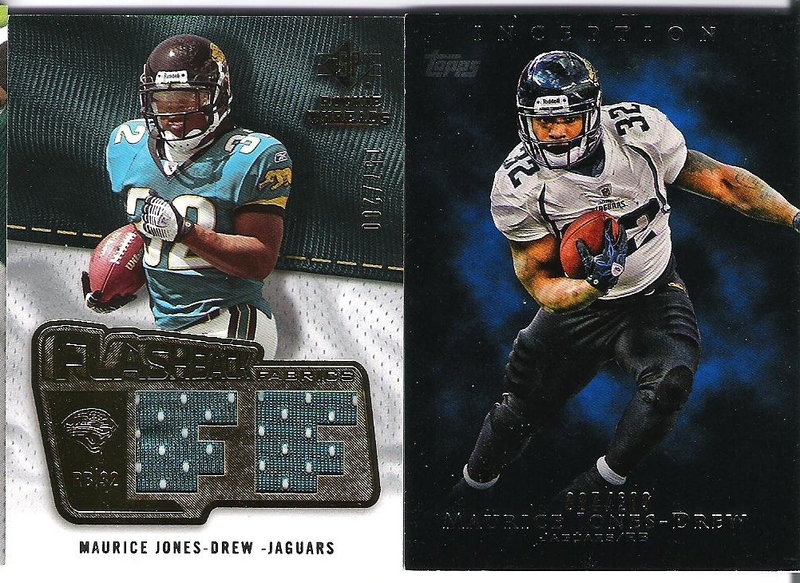 Two of the swankier cards in the whole lot. 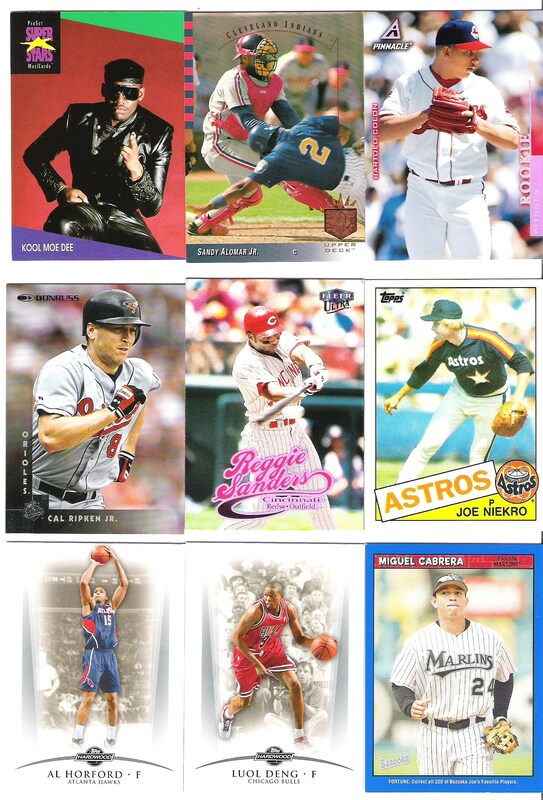 Good stuff..
Kareem Sticker, embossified AI, Jersey AI, LeClair, Granger, Love, and Pierce.. I guess LeClair isn’t strictly a keeper, but I’d need a Byfuglien or Marian Hossa relic for it, so the window is pretty narrow. That’s also my first hockey swatch card. My only other Hockey hits are Doug Gilmour and (I think) Tim Taylor autos. 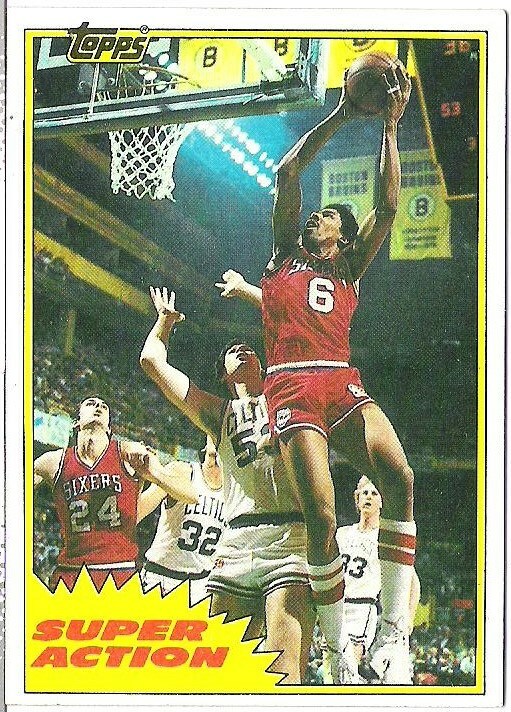 I guess Kareem and Kevin Love could be had too, if you have something similar of someone I might like more. 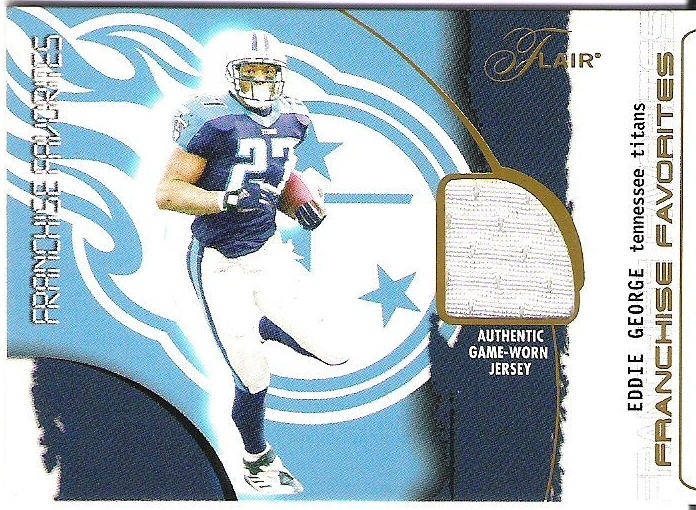 Reflections football was one of my faves from the past decade, so being able to get the jersey third of my impending Paul Pierce trifecta from the basketball version was nice. 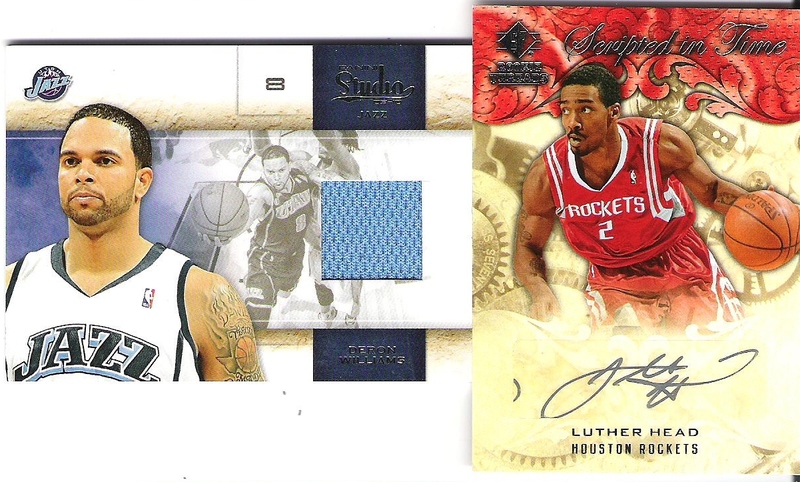 Studio Deron Williams powder blues & a Luther Head auto that's all kinds of classy. The ink is even silver. Freakin' sweet.. 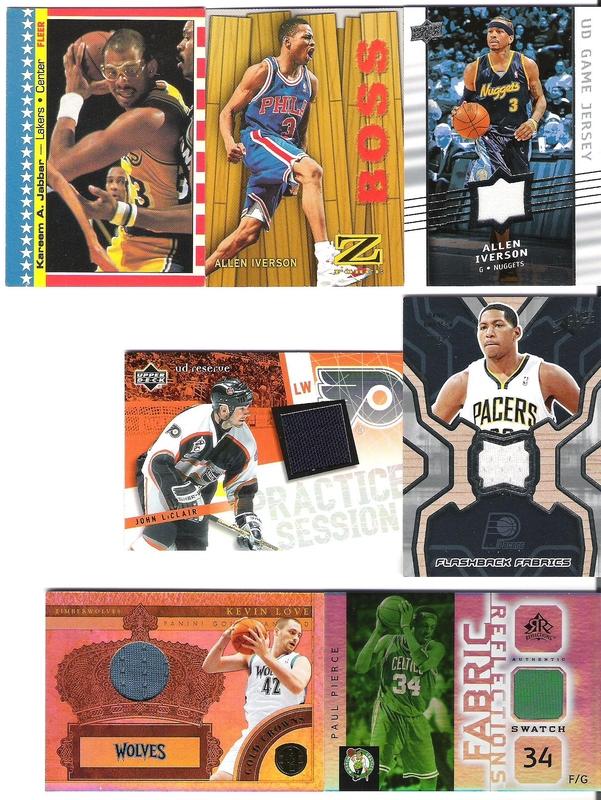 Finally, Luol Deng Bowman sticker auto, Trilo3y jersey, & Sterling jerseyfractor /199..